Hue/Boy is Christiane Hütter and Daniel Boy, who are a part of the Invisible Playground network, which consists in six reflective practitioners working at the intersection of play and urban society – as game designers, artists, urbanists, curators, authors, musicians, scenographers and in many other roles. At the Prison (Fængslet) in Horsens, they developed several games and a LARP as a part of Horsens Happening. 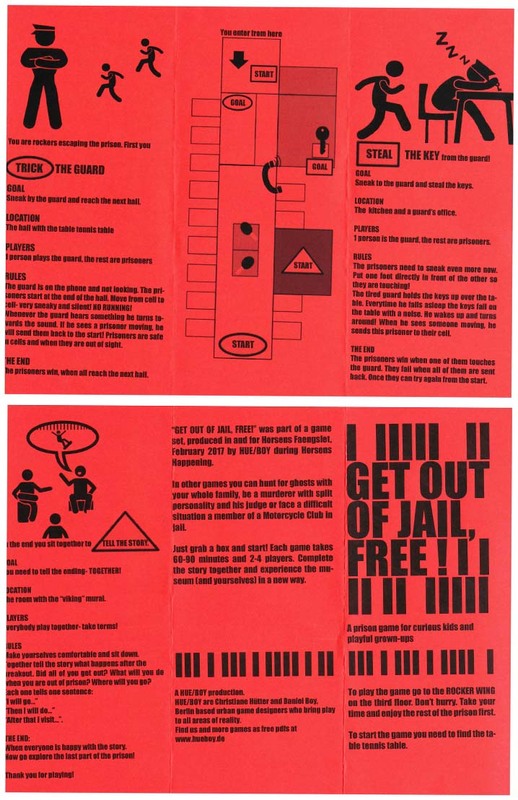 GET OUT OF JAIL, FREE? was one of them. The games can still be played at the Prison (Fængslet) in Horsens. Christiane Hütter aka Frau Hue was part of the second Hitparaden Festival.